Create Your Very Own Eternity Ring! An eternity ring is often given as the wedding band, with it raising in popularity the last couple of years. A perfect compliment to an engagement ring, it will stand out on its own. Celebrities have been seen with eternity rings for a long time, you have Marilyn Monroe, Kim Kardashian, Vanessa Minnillo, Jennifer Garner and Jada Pinkett, just to name a few. They also have the luxury of being exposed to the finest, which includes the option of a custom made design. But, what if you are not a celebrity, and you want to have the chance to personalize something that is so unbelievably beautiful and that represents so much? Well, lucky for us, our own Since1910.com has answered our wishes. The leading carrier of various high-end brands, such as Tacori and Scott Kay in the nation made this happen: Create Your Own Eternity Ring. Something that has never been done before, they are the first in the industry to give you the option of choosing your exact specifications, while only paying for the exact number of diamonds required to build your unique eternity ring. Everything is up to you to customize, you can choose your diamond shape, size, color, setting and of course, finger size, while still only paying for the exact number of diamonds needed to make your ring, your way. Giving you all the power to make a truly exclusive ring for yourself, or your loved one. The all around user friendly website stays right on track while you click, change options and perfect your custom made eternity ring. You can even view an HD video of each eternity ring in every shape and every size. It’s unbelievable! A ring can mean so much when it comes to love. It is the ultimate, and one of oldest symbols of your commitment to another person. An engagement ring, a wedding band and of course, an eternity ring are the most popular. We all know what an engagement ring means, with a center diamond it symbolizes the commitment you are ready to make to that person. The wedding band, something for both partners that symbolize your union. But, what about an eternity ring? What sets an eternity ring apart? An eternity ring means just that, eternal love. Most engagement rings are set with a center diamond because diamonds are one of the toughest minerals on Earth, if not the toughest. It is virtually unbreakable, which makes it perfect for an engagement ring. A promise, a promise of love and commitment that will not be destroyed. Now imagine what an eternity ring symbolizes, when the ring itself, is a band of diamonds. I love that this is something that can finally be done, not only for the chance to have something so valuable be completely designed by me or someone I love, but the fact that it is still affordable. Try out the Custom Eternity Ring Builder at Since1910.com and see for yourself how you can create a personalized, custom eternity ring for the love of your life! Try Before You Buy Custom Eternity Rings Builder Launched! Since1910.com today announced a new “try before you guy” program coupled with a new custom diamond eternity rings builder. Presented in a Do-it-Yourself manner, this new interactive tool allows customers the ability to select the diamond size, color, clarity, cut, mounting and finger size. 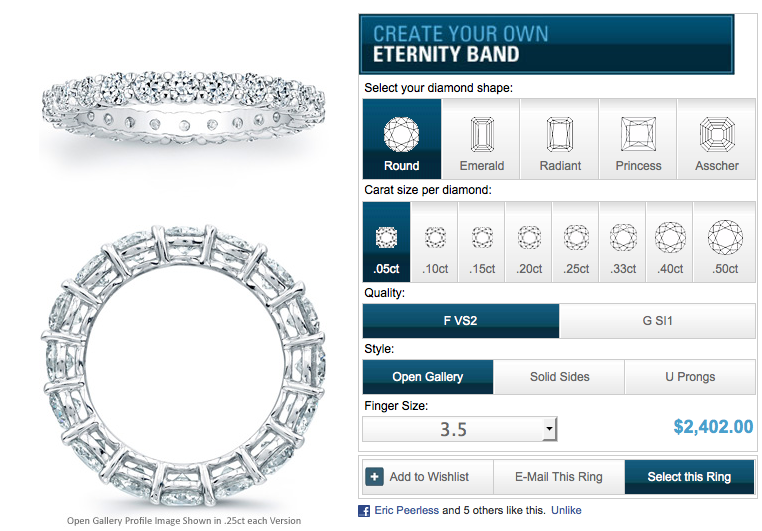 As the customer creates their diamond eternity ring, the corresponding price will be displayed. The eternity rings builder will calculate the exact number of stones required based on the diamond size, shape, and finger size and provide an exact price. A customer with a size 4 finger will pay less than a customer with a size 8 finger as the eternity ring builder calculates the exact numbers of stones required to build each ring. 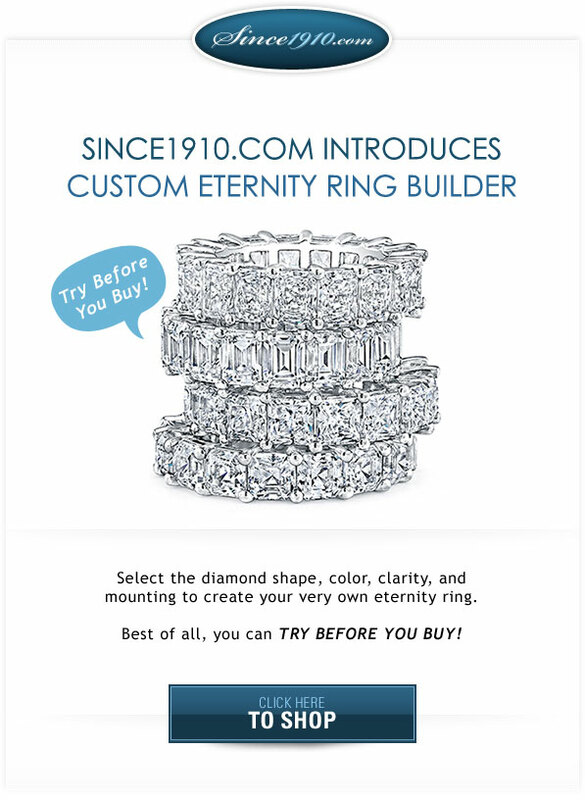 Since1910.com is also offering a “try before you buy” option, where they will send 1 or 2 CZ versions of the eternity rings in the mail at no charge, which allows customers the opportunity to compare multiple diamond sizes and actually see what the ring will look like prior to purchasing. Since1910.com launched the newest edition to our website today. A custom diamond eternity rings builder that allows you to select the diamond shape, size, color and clarity, setting style and finger to size to create a completely custom and unique diamond eternity ring. Choose a diamond shape, (round, emerald, radiant, princess or asscher), and then select the individual diamond size for each stone. Once you’ve selected the diamond shape and diamond size, you can select the color and clarity of the diamonds as well as the style of the ring. After selecting the style, select your finger size from the drop down. The finger size of the eternity ring will determine the specific price of the ring because the number of diamonds required to make the ring is directly correlated to the finger size. A finger size of 4 will require less diamonds than a finger size of 7. Since1910.com’s custom eternity rings builder is the first of its’ kind and a truly unique and fun way to builder your own custom eternity ring. We are proud to launch this eternity rings builder as our customers will only pay for the exact number of stones required to build their special ring. We’d love to get your feedback on the eternity rings builder, so don’t forget to post your comments here! A diamond eternity ring features diamonds of the same shape and size in a continuous circle around the band offering an unsurpassed amount of brilliance, fire, and sparkle from every angle. Eternity bands are simplistic and elegant. They can be worn alone or are a great compliment to an engagement ring. Diamond eternity rings can be purchased as an original wedding band or an anniversary band. 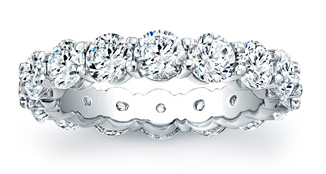 Diamond eternity rings make a great gift for that special milestone anniversary. The traditional eternity ring contains all diamonds, but some contain diamonds with alternating gemstones or just gemstones. The most popular eternity ring design is the open basket shared prong design. In an open basket design the diamonds are set at the same height allowing light to enter and flow through all the stones evenly. The shared prongs allow the diamonds to be set using the least amount of metal possible, so all you see is the brilliance and fire of the stones. Another popular eternity ring design is a channel set. This setting allows for the diamonds to be set within the band providing a smooth surface. Since light enters and exists through the table of the diamond this setting offers brilliance and fire with a more tailored look. What diamond shapes are used and why? The most popular diamond shape used for eternity rings is the round brilliant followed closely by the princess cut and radiant cut. These shapes are known for their brilliance and fire and can be set very close together making them the perfect shape for any style eternity ring. Over the past several years, asscher and emerald cuts have gained popularity and provide a very classic elegant look. What diamond color and clarity is recommended and why? For diamond eternity rings we recommend colorless or near colorless diamonds with a clarity rating of SI1 or better for round brilliant cut, princess cut, and radiant cut diamonds. For asscher cut and emerald cut eternity rings we recommend colorless diamonds with a clarity rating of VS2 or better. At Since 1910 we take pride in offering something unique in the way of eternity rings….our custom eternity rings builder. Our custom eternity ring builder offers you the opportunity to build your own eternity ring custom made to your exact finger size in three easy steps; choose your diamond shape, choose your finger size, and choose your diamond color and clarity. This is a great benefit to you because you only pay for the exact number of diamonds used. When purchasing a pre-made eternity ring often times it will need to be sized down, but you will still be paying the original price regardless. 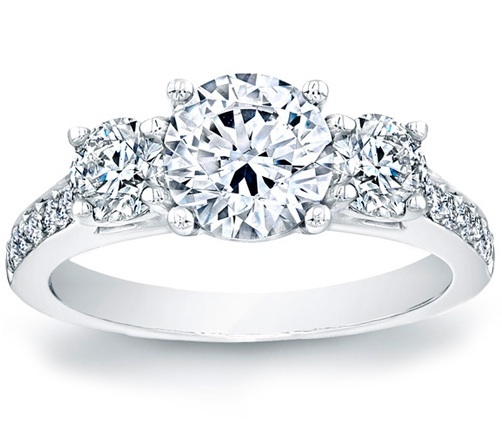 Once known as an anniversary ring, three stone engagement rings have gained popularity over the past several years. A three stone engagement ring represents a couple’s relationship – the past, the present, and the future. The three stone engagement ring contains just that; 3 stones. 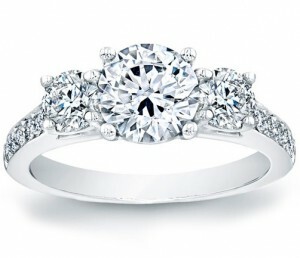 The traditional three stone design is a plain metal band with prong set white diamonds. The diamonds are all the same shape and color with the center stone being slightly larger and set higher than the two side stones. Today, three stone settings are available in a variety of designs. While the traditional three stone is still extremely popular many couples are choosing settings with side stones of a different color or shape. Prongs can be replaced with bezels and plain bands replaced with scroll work or small accent diamonds. If you’re creating a three stone for an anniversary ring you have some options. 1. Use your engagement diamond as a side stone representing the past and choose a new center stone and second side stone as the present and the future. The new center diamond should be slightly larger than the side stones. When choosing new diamonds you’ll need to stay within the same color range if purchasing white diamonds. 2. Use your engagement diamond as the center stone and purchase two new side stones. You have some options here as well. If you want to wear your three stone on the same hand as your wedding band or your right hand a five or seven stone wedding band or a diamond eternity ring will match perfectly.